Try this breakfast or tea bread for Christmas morning. The braid is reminiscent of a pine cone or "Wickelkind" (child wrapped in swaddling), a symbolic start to your day. Filled with jam, almonds and raisins, the bread is just sweet enough to please, but you might enjoy it with a little butter spread on top. This bread can be refrigerated overnight, which makes it a snap to bake for breakfast or Elevensies. Lightly spoon flour into measuring cup or weigh. Place flour in a mixing bowl and create a hollow in the middle. Place yeast and 1 teaspoon sugar in the hollow, pour the milk over that and sprinkle a little flour over the milk. Cover with a clean towel and let the yeast proof for 15 minutes. In a separate container, whisk together melted butter, room-temperature eggs, sugar, and salt until sugar starts to dissolve. Add the egg mixture to the flour and yeast and mix with your dough hook until dough is smooth and satiny -- about 5 minutes. The dough will still cling to the bowl a little bit but not be very sticky. You may add up to 1 tablespoon of flour or a sprinkle of water to adjust the consistency. Butter a clean bowl, gather the dough up into a round ball and place in a bowl, turning once to coat. Cover and let rise for 15 minutes. Mix the apricot jam, almonds and vanilla together to form a thick paste. Roll the dough out on a lightly floured board to form a 12 inch by 16-inch rectangle. Spread the apricot paste down the middle third of the dough. Sprinkle the raisins over the paste. Using a sharp knife, cut 1-inch strips on the diagonal on the two outside thirds, stopping before you cut into the paste. Fold one end over the filling and begin braiding by folding the strips of dough over each other like crossing arms or lacing up boots. See here for image. Finish the braid by folding the far end over before you cross the last two strips, to form a package. Don't worry if you can see the filling a little bit. 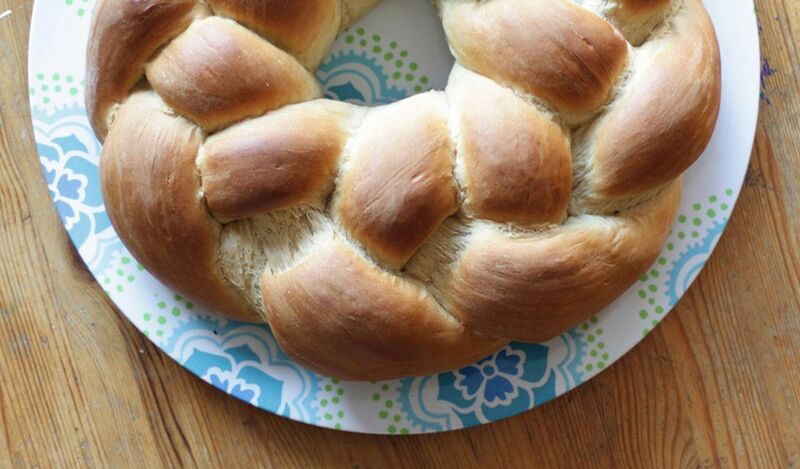 Place the bread on a parchment paper-lined cookie sheet and place in the refrigerator overnight. Heat the oven for 1/2 hour to 385°F. Remove braid from the refrigerator at this time. You will not see any appreciable rise. Mix egg yolk with 2-3 tablespoons of water to make an egg wash and brush it over the braid. Place bread (still on a cookie sheet) on the middle rack in the oven, turn oven down to 350°F and bake for 30 minutes or until golden brown and done. Serve as is or brush with a sugar glaze (1 tablespoon sugar, 1 tablespoon water, heat until dissolved) or a powdered sugar glaze, American style (mix 1 cup powdered sugar, 2 tablespoons melted butter until crumbly. Add milk by the teaspoon until spreadable or of drizzling consistency).